HMH Books for Young Readers, 9780547857862, 288pp. 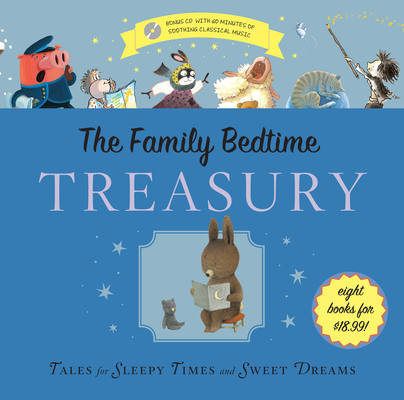 Soft and warm, sweet and soothing, the stories and poems in this impressive, silver-jacketed anthology—complete with one hour of calming classical music on CD and for download—are just right for bedtime. You’ll find eight complete picture books: Five Little Monkeys Reading in Bed (Eileen Christelow), The Napping House (Don Wood/Audrey Wood), Bedtime Bunnies (Wendy Watson), Tell Me Something Happy Before I Go to Sleep (Joyce Dunbar/Debi Gliori), The Goodnight Train (June Sobel/Laura Huliska-Beith), The Quiet Book (Deborah Underwood/Renata Liwska), Gideon (Olivier Dunrea), and No Sleep for the Sheep (Karen Beaumont/Jackie Urbanovic). Pair this with The Family Storybook Treasury!